The content you create is more important than the offer you make. Using professionals to create your content is a must and will pay off in the end. Your brand is your strongest marketing tool; it’s who you are and what differentiates you from the competition. The marketing you do internally (and directly to your customers) is a higher priority over your external marketing. Most websites incorrectly focus on their company and not the informational and content needs of their customers. Put your customers’ needs first and not the product or service you’re selling. Lead generation is only one part of the content picture. In the not-too-distant future, the majority of content in which consumers engage will be corporate messaging. How we sell has changed forever; relevant content is a must in the new customer-driven sales process. When done in unison, content creation and marketing are your one-two-punch. Customers expect more. Know their needs and give them what they want. I find that often times those in marketing feel like they work in a bubble. So much of what we do in marketing comes down to trial and error. But, wouldn’t it be nice to have insight into the current trends and how they are working? Well, here you go! Here are nine compelling stats that should give you some great direction when you are planning your 2015 approach. Seen any good lead gen stats? Share them with us! 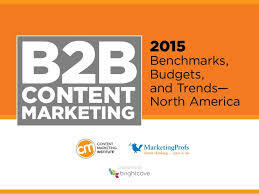 I recently came across the fifth annual B2B Content Marketing Benchmarks, Budgets, and Trends – North America report by the Content Marketing Institute on the Salesforce website and thought I would share their findings with you. I think you’ll find the stats and trends in content marketing both interesting and helpful as you approach developing and executing your own content marketing plan in 2015. Here are the highlights. Only 35% of content marketers have a documented content marketing strategy. 60% of those who have a documented strategy, though, say their content marketing is highly effective. Only 32% of those with a verbal content marketing strategy would say their content is highly effective. Take a look at other differences between companies with a well-documented content marketing strategy and those without. The amount of content being created is growing immensely. 70% of marketers are creating more content than last year. With this growth, it is more important than ever to create content that breaks through the clutter and stands out. Look for new ways to engage your audience with your content. 42% of content marketers say they publish new content daily or multiple times per week. 31% of “effective marketers,” though, publish new content multiple times per week and 32% of marketers with a documented content marketing strategy publish new content multiple times per week. While effective content marketers are obviously producing a large amount of new content, something can still be said for producing high-quality content. You can’t just be a content factory. Creating quality, engaging content with a clear objective should still take precedence over creating just another e-book. 63% of marketers rated LinkedIn as effective or very effective. Twitter and YouTube came in second and third at 55% and 48% respectively. 84% of marketers say “brand awareness” is the most important goal, and lead generation came in second at 83%. CMI noted, though, that “customer evangelism” was new this year to the list of goals. This goes right along with Jay Baer’s Youtility concept and using your content to create customer evangelists. Customer loyalty ranked sixth with 69% of marketers deeming it important. Website traffic, though, continues to be the most-used metric to assess content marketing success. Over 60% of marketers cite website traffic as their most important content marketing metric. Sales lead quality was second at 49%. This is really interesting when you compare it to the stats above—organizational goals for content marketing. Organizational goals do not align very well with the top metrics content marketers are using to assess their success. Metrics that help assess brand awareness like “benchmark life of company awareness,” “benchmark lift of product/service awareness,” and customer renewal were all cited by fewer than 25% of B2B marketers as a metric they use to assess success. This may be one of the explanations to #7 below. This means the majority of content marketers are not successfully tracking ROI. Only 35% of marketers with a documented content marketing strategy are even successful at tracking ROI. This solution comes with greater alignment between organizational goals and metrics used to track success. Marketers first need to be tracking the right things. Take a deeper look at your core key performance indicators and how you measure them. Implement a process to measure actionable metrics that can demonstrate cause and effect relationships. Where do you see your business among these stats and what do you plan to do differently or try for the first time this year? Let us know! Even though social media platforms have been around for awhile, there is still a lot of confusion over just how to use them to their best potential. Simply creating a LinkedIn or Facebook account and then letting it remain dormant to collect dust isn’t an effective strategy and won’t drive you leads. An effective social media strategy involves a dynamic plan for how you intend to use the different social media together in a cohesive and ongoing manner to meet your objectives and drive leads. It takes thought, it takes resources, and it takes some time. Make the commitment, and you’ll reap the rewards. Know your business and your customer. Once you’ve determined who you are as a business and exactly whom you are targeting, then select the social media that makes sense for your business vertical and your prospects. Don’t try to be everything to everyone. Be strategic and tactical. Better to do three things really well than seven poorly. Every post, tweet, and update needs to focus on your big-picture objectives. So, choose your words and your platform wisely. Make sure you always have an end-goal in mind: download an e-book, click through to a special landing page, sign up for more info, attend a webinar, etc. Capture the information you collect and use it strategically to guide your prospects through the process. Use campaigns to create hype. Social media campaigns add another valuable layer to your marketing plan. Thoughtful use of social media is a powerful tool that enables you to create hype around unveiling your new product, service, ad campaign, whatever. Social media is also a good (and inexpensive) opportunity for branching out in ways we just couldn’t do with traditional media. Take full advantage! Social media enables us to extend our reach and communicate with prospects in several different manners. Put as much thought in to your social media campaign as you do other important areas of your business. Whatever approach you decide to take, keep it focused and on strategy and do it well. Share your social media successes with us.